We have 2 black males available! They are 6 weeks old and ready to go this week. Puppies were born April 1st. They will be UKC/AKC registered. The puppies will be introduced to water and wings. They will be vet checked, wormed, have first shots, dewclaws removed, and puppy starter kit. Sire: MILES is a beautiful chocolate male weighing 85 lbs. He has excellent drive and determination when it comes to hunting and retrieving and he is an excellent family dog when he’s not working. Miles has his AKC Senior hunt title and his HRC hunter retriever champion title. He is the grandson of 3x GRHRCH UH Dakota's Cajun Roux MH. Miles has OFA hips good, OFA elbows normal, CERF normal. He is EIC, CNM and DM clear. 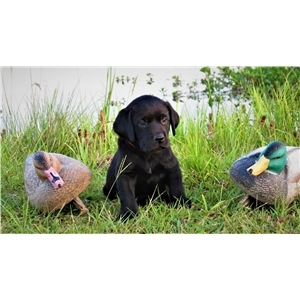 Dam: VEGAS has a sweet disposition and all the qualities we love to see in a family companion and hunting retriever. She is an athletic smaller framed female weighing 50 pounds. Her sire is HRCH Washita’s Lone Ranger MH. He also has 1 Master National Pass. His sire is 2x GRHRCH UH Washita’s One Hot Tamale MH MNR. Vegas comes from a long list of titled champions. She has OFA hips good, OFA elbows normal and CERF normal. She is EIC, CNM, and PRA clear.